FOUNTAIN INN, S.C. (June 7, 2018) – AVX Corporation, a leading manufacturer and supplier of advanced electronic components and interconnect, sensor, control, and antenna solutions, has launched a new high-temperature wet electrolytic tantalum capacitor series. Designed for use at 230°C, the new TWA-X Series wet electrolytic tantalum capacitors feature a high-capacitance cathode system that achieves high CV performance in standard case sizes and a hermetically sealed, welded tantalum can and header assembly that provides robust resistance against mechanical shock and high-frequency vibration. 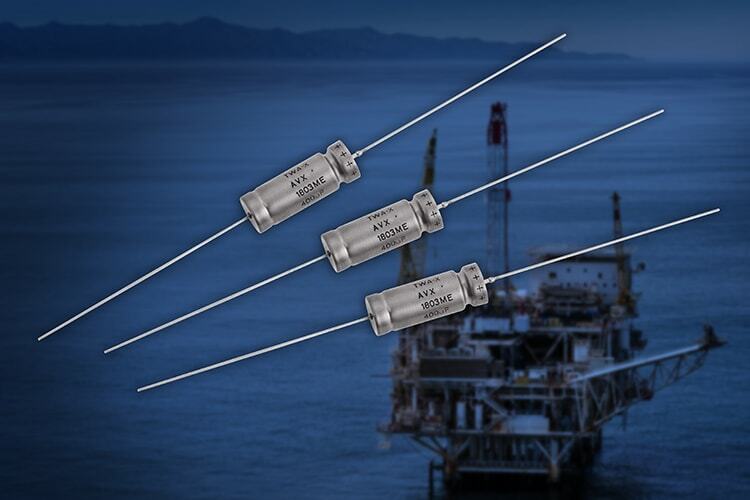 Ideal for use in military, aerospace, industrial, and oil drilling equipment, TWA-X Series capacitors are also mechanically tested in accordance with MIL-STD-202 and provide the highest capacitance available for the longest duration – up to 400μF for 500 hours of operation at 230°C – of any wet tantalum capacitor in the form factors offered. They are currently available in DSCC case size T4 (AVX case size “E”) with two initial ratings: 400μF/100V and 330μF/125V. For more information about AVX’s high-temperature TWA-X Series wet electrolytic tantalum capacitors, please click on product button below. For immediate availability, please visit Digi-Key and Mouser Electronics. For all other inquiries, please visit www.avx.com, email inquiry@avx.com, follow them on LinkedIn and Twitter, like them on Facebook, call 864-967-2150, or write to One AVX Boulevard, Fountain Inn, S.C. 29644.